To gain a better understanding of our surroundings we categorize everything according to specific characteristics. With plants, we also have been doing this for centuries. A very influential work, Enquiry into plants, was written by the Greek philosopher Theophrastus sometime in the third century BC. The system that has been in use in modern times has been introduced by Linneaus. He changed both the way we named plants and families (the nomenclature) and the governing property that determined which plants are related to each other. He was the first to determine plants by their sexual organs, his system did not however regard evolutionary relationships between species. Charles Darwin’s The origin of species paved the way for a phylogenetic approach to the taxonomy of all living beings. The only image in Origin of species shows the idea of convergence. The most radical idea published by Darwin was that of divergence. This idea states that over time a given species split into different species with a lot of shared characteristics, but also some distinct ones. This process has been going on since the first form of life on earth and it is one of the main reasons why there is such a massive variety of life on earth. But at the same time it also shows that species that are clearly different have a shared ancestor. Think for example of the bone structures between whales and humans (both mammals) or the difference between tulips and oaks, but the shared characteristic of having chlorophyll in their cells. Long enough back in history there was an ancestor from which mammals and fungi split. Early classification systems just had two kingdoms: plants (Plantae) and animals (Animalia) and at this time a kingdom was the highest taxonomic rank. Ernst Haeckel added a third kingdom for one-celled life: protist (Protista). 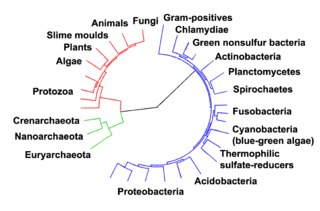 Over time the fungi (Fungi) kingdom was split from the plant kingdom and several bacterial kingdoms (Eubacteria and Archeabacteria) were added. Recent research showed that the plants, animal and fungi kingdom shared the same cell structure as the protists. For this reason, Carl Woesse proposed a new and higher rank: the domain. The domain contains the Archea, Bacteria and Eukayra. The domain Eukayra contains the kingdoms Plantae, Animalia, Fungi and Protista.